Aleksandr Sergeyevich Pushkin is considered by many literary critics and people around the world as Russia’s greatest poet, author, and the founder of modern Russian literature. Pushkin was born into a Russian noble family on June 6, 1799. As a student attending private school in Moscow, Russia, he excelled in French culture and the French language. Also, during his youth, he began crafting short stories and poems. As his writing skills matured he developed his literary gift of captivating readers through stories and verse that were embedded with topics he felt passionate about. Often these controversial topics included love, racism, social injustice, and political humor and commentary often unwelcome by Russian officials. Some of his works chronicled the lives of his ancestors. Aleksandr Pushkin was a husband and a father. In 1831 he married Natalya Goncharova, considered by many to be the most beautiful woman in Russia. The couple eventually had four children. 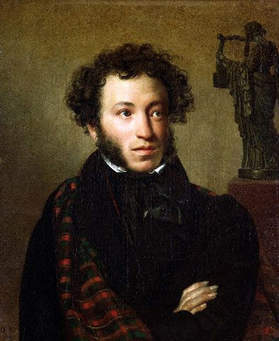 Despite his distant African ancestry, Aleksandr Sergeyevich Pushkin lived as a white man in Russia, but he eventually was oppressed by members of Russian monarchy. Initially he was on a first-name basis with Tsar Nikolas I and visited the royal estates on several occasions. However, as Pushkin’s writings became more critical of the Russian government and Russian elite society he was brought into an alliance with the Decemberists, members of the Russian military elite who opposed the Russian tsar’s authoritarian rule. Decemberists wanted more freedom and the ability and right to govern their own affairs. Pushkin’s work became increasingly unpopular with the Russian Monarchy and therefore he was considered an enemy of the Tsar. In 1820 he was sent into exile in Yekaterinoslav in Siberia. By autumn 1826 Pushkin had found his way back to Moscow. Throughout his period of exile, as before Pushkin never stopped writing. His accounts of everyday people living life entrenched in rich Russian folklore. These stories and poems endure to this day because people around the world identify with his characters and stories on a personal level. His memorable contributions to literature include: Blackamoor of Peter the Great, Tales of Belkin, Queen of Spades, Ruslan and Ludmila, The Bronze Horseman, and The Tale of the Tsar Sultan. On February 10, 1837, Aleksandr Sergeyevich Pushkin was mortally shot and killed during a duel he had entered to protect his wife’s honor from Georges d’Anthes, a French officer in the Russian Army who attempted to seduce her. He was 37. Today there are numerous monuments in Russia that are tributes to the nation’s greatest writer. The largest is the Pushkin Museum in Moscow. Pushkin Genealogy, https://www.pbs.org/wgbh/pages/frontline/shows/secret/famous/pushkingenealogy.html; Nicholas Wirth, Hannibal, Abram Petrovich/ Gannibal, A. P. (1696?–1781), BlackPast.org, https://www.blackpast.org/gah/hannibal-abram-petrovich-gannibal-p-1696-1781; D.D. Blagoy, “Alexander Sergeyevich Pushkin,” Encyclopedia Britannica Online, https://www.britannica.com/biography/Aleksandr-Sergeyevich-Pushkin.